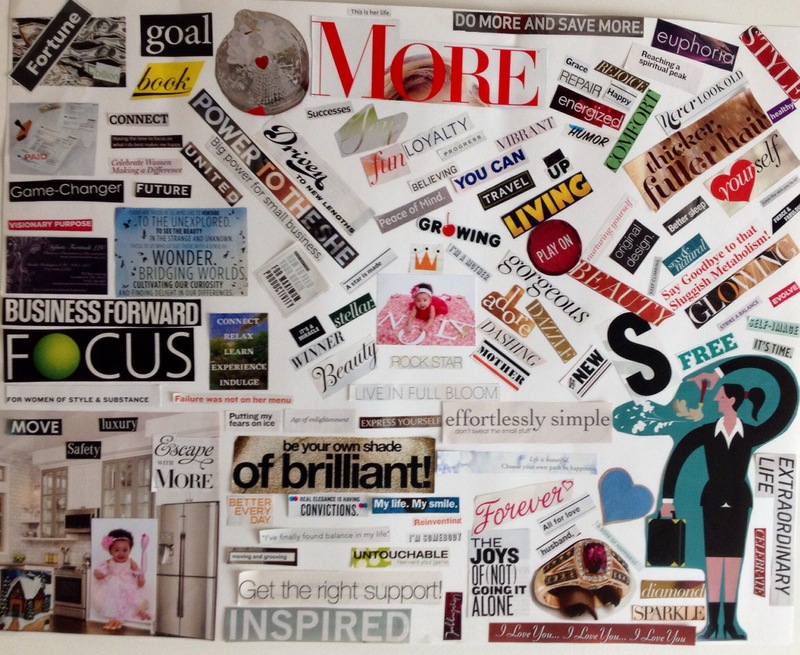 I’ve completed my 2014 vision board and I’m uber excited!!! There are several types of vision boards, and some elect to have a variety of boards that each represents an area, goal, or project they have; but I decided I would create a board that embodies everything I am and want to accomplish this year. I have it taped to my ceiling so that I can look UP at it daily as affirmation! My vision is divided into 8 areas(I didn’t start with wanting to have a certain number of sections. I simply took some time to think about everything I wanted–every area in which I wanted to improve), with the center representing my motivation, my why, my daughter and the words and phrases that come to mind when I think of her. The other areas represent what I want MORE of in my life, what I want to accomplish via my business, my health goals, the new home I want to provide for my daughter, words and phrases that describe my definition of happy, independent of others’ expectations and definitions, the unconditional love of a husband, and me dusting off my shoulders, becoming the next best version of myself! Those who know me know that my favorite number is 7, as biblically it represents completion. Therefore, the number 8, one more than 7, represents an over-abundance, overflow, exceeding what was originally thought of as complete. Eight also represents resurrection, regeneration, and the beginning of a new era. How perfect is that message for a new vision board?!?! God is definitely taking me into a new era and I’m preparing daily! These 8 sections represents the MORE that’s in STORE for ME!!! Get some magazines & newspapers, and clip pictures and/or words that speak to what you want to achieve. Then attach them to a poster board, cork board, or even a wall or mirror in your home. Voila, your vision board is complete!